This issue of Exhibit Spotlight focuses on the team at Blue Jay Consulting where we provide a ‘one-stop shop’ service to fulfill whatever they need. 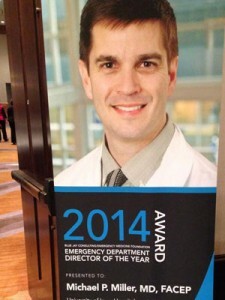 Blue Jay Consulting seeks to help make an emergency department the best it can be. 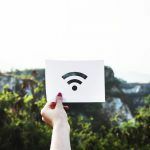 Sometimes this is a relatively straightforward task; other times facing a complex array of problems that require a multi-tiered, long-term set of solutions. 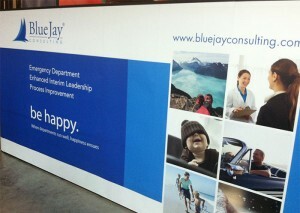 Blue Jay’s goal is to optimize the performance of every organization with which they work. Their team figures out how to maximize the capability of systems and personnel alike. Their techniques are proven, their consultants are respected and their clients benefit from quantifiable results. 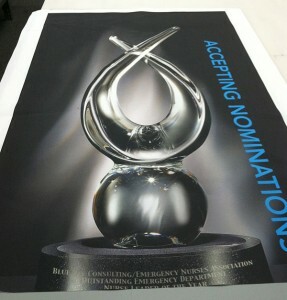 Blue Jay faced the challenge of creating a diverse array of marketing collateral for an upcoming award ceremony in a timely manner. 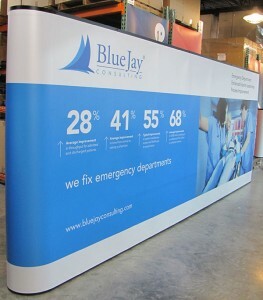 They required freestanding portable banners that welcome guests into the event and communicate physicians being honored, as well as 20 foot backwalls that illustrate what the company does. 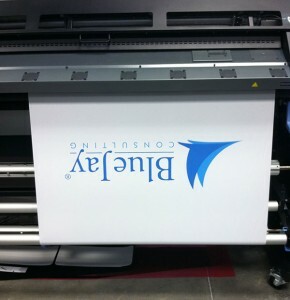 In addition to marketing signage, the Blue Jay team needed custom engraved awards to dedicate to award winners. 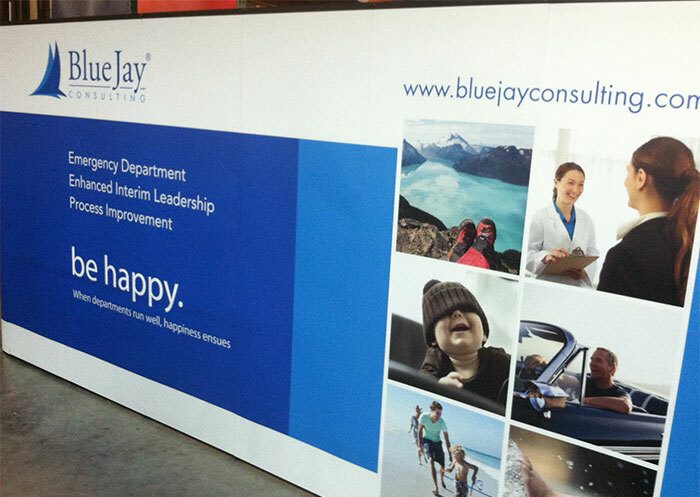 Blue Jay chooses ExhibitDEAL for their event promotion needs because of our ability to meet strict deadlines without sacrificing quality. If something is ever damaged in transit or the finished product is not up to expectations, we order replacements before the ceremony. This track record for quality and expertise has earned ExhibitDEAL a reputation as a dependable go-to team for tradeshow displays, banners, branded giveaway items, and ceremony awards. There are so many styles and sizes of exhibit displays, it can be daunting to know which styles and sizes fit different needs. 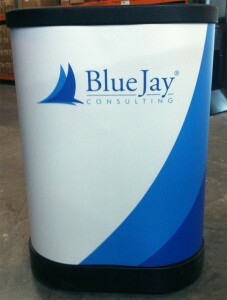 The Blue Jay team had a vision of the caliber of exhibition they needed to achieve. Always welcoming a challenge, we began to strategize and agreed that popular, easy to assemble Pop Up Displays will best provide the presence they require. 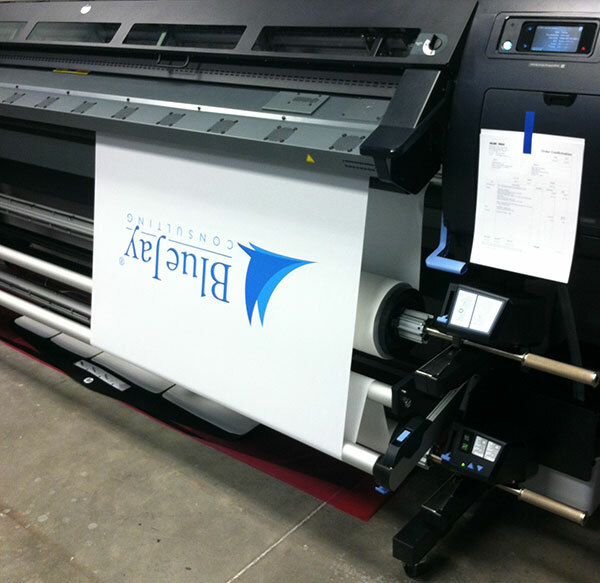 After the graphic designers approve the finished design, the production department begins outputting the graphic panels from our High Definition 1200 DPI printer that utilizes official H.P. inks to ensure vibrant colors that match up to the Pantone color spec. In addition to banners and popup displays, ExhibitDEAL helped produce engraved awards for the American College of Emergency Physicians winners; award pictured here on backwall graphics. 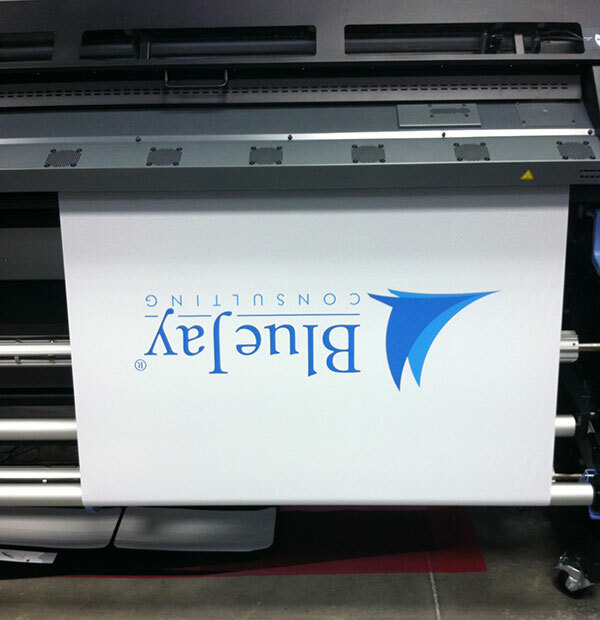 Graphics are cut by our professional production team and inspected for quality to ensure no ripples or tears were created during the printing process. The finished graphics are assembled onto the display just as it would be during exhibition to ensure that all graphic panels have been cut to perfectly align with one another for seamless branding. 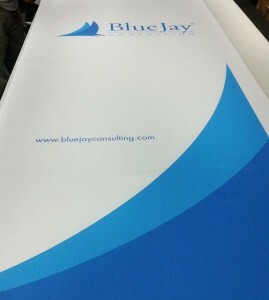 Accompanying accessory hard case to counter kit with custom printed full wrap graphics to extend the Blue Jay branding for presentation needs. 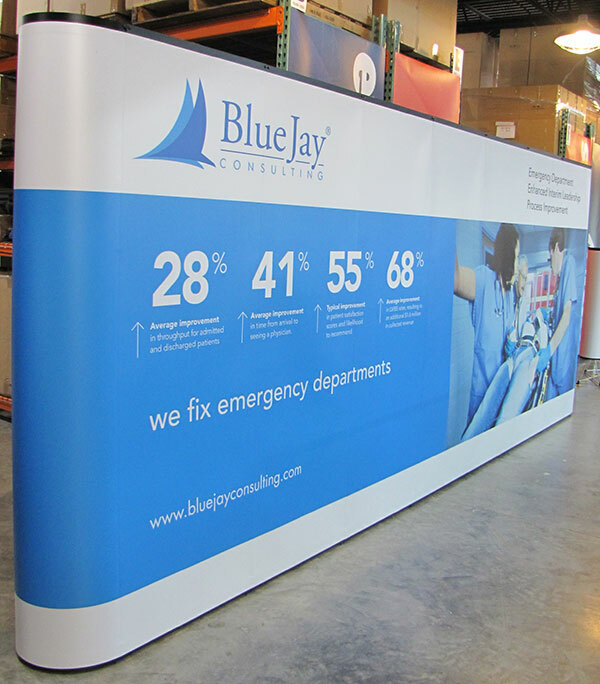 ExhibitDEAL has had the pleasure of working with Misty Butcher of Blue Jay since 2011 to regularly refresh their high definition graphics branding. 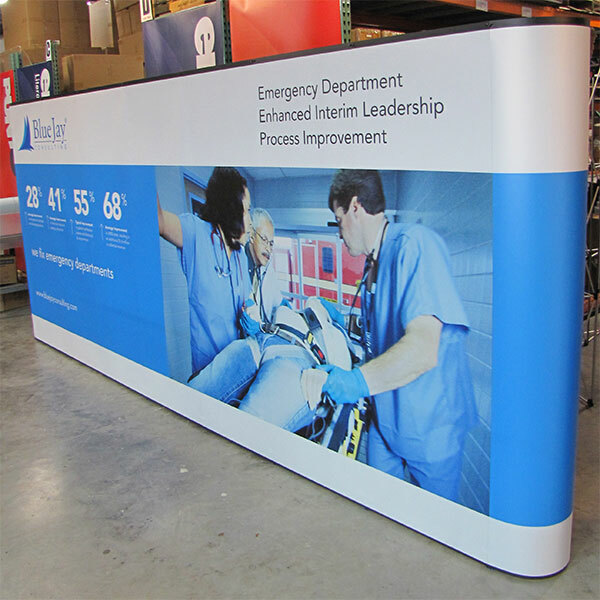 Whether an event required backwall displays for marketing, branded counters for presentations and demos, branded promotion giveaway items, or even custom engraved awards ExhibitDEAL was there to provide top quality production at the best deal. Do you have an upcoming event? ExhibitDEAL offers full service production, including free consultation and 2 hours of complimentary graphic design to get your booth presence started off right. Give us a call at 866-577-DEAL or Email today. 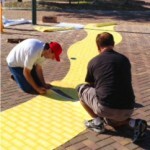 Our team of exhibit experts are on hand to answer any questions you have and guide you to the best DEAL.